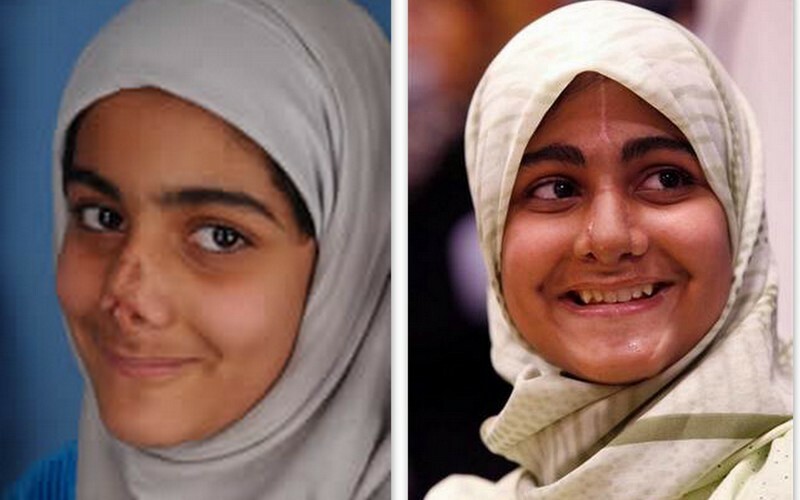 I watched a reality program on TLC, centered around 12 year old Marwa Naim from Iraq. It focused on her journey to get a new nose after a big chunk of hers was lost when an explosive hit her family’s home in northern Baghdad. She endured taunting from the kids at school and this journey would help in making her look normal again. After a series of reconstructive surgeries by the doctors at Ronald Reagan UCLA Medical Center, Marwa Naim got her nose and her life back. My heart broke at her reaction when she looked in the mirror after the first surgery, she screamed and cried because her nose looked horrible. She preferred it the way it was before the attempt to make it better. It didn’t matter that she still had three more surgeries to go, all she saw was what she saw, a huge chunk on her face. I thought it looked horrible as well, but the doctors explained, that it would look worse before it looked better. That statement struck a chord and got me writing this. Maybe it seems like things are getting worse, instead of getting better even after you dropped it at His feet. You've looked in the mirror and screamed at all the things life has thrown at you despite your surrendering to Him. It seemed like things were getting worse in the previous year instead of better like you expected. Don’t be discouraged like Naim was when she looked in the mirror the first time… In reconstructive surgery, it gets worse before it gets better. The recovery process inconveniences you and sometimes looks bad, but the end is perfect. You've gone through the pain and ugliness of surgery, you're now in the season of healing and wholeness and being fulfilled. Embrace the joy of the New Year, the finished work of God in whatever situation you’ve handed over to Him. It may have been a hard time, but when He’s done with you, you’ll know for sure that every moment of waiting and distress was worth it. "it’s time to relax, knowing that He’s performing a reconstructive surgery on you… " This entire bloc entry speaks to my heart, especially this line. Note to self, you are beautiful. Okay o, i hear you loud and clear, its just so hard to wait .. Happy new year! "It could get ugly before it gets beautiful" Words of a song I've had on replay all afternoon. I pray He gives us continuous grace to be patient. the girl's story was sad and touching but so true in relation to what you've said. like i read somewhere.. 'a diamond is just a piece of Charcoal that underwent stress pretty well. This story has given me a new sense of direction.Im glad to know a talented writer.Awesome! On point and Holy Spirit inspired as usual. THIS is what we "Christians" need to remember always especially when we are "claiming" all the prophecies flowing from the pulpit. There is ALWAYS a process with God and most times it does get real UGLY before it becomes Beautiful. Many never see their claim or blessings come to pass because there's little or no FAITH to still believe, love and worship God WITH SAME OR MORE TEMPO through the times of painful ugliness. Hi Dear, I have tagged you in the BBC book list tag. Please, check the most recent post on my blog for details.